Posted by themotochanneladmin & filed under Cafe Racers. 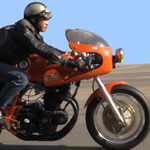 Takashi Iwamoto of Cascade Cafe Racer in Hawthorne, California shows us a custom cafe racer built in the style of an endurance motorcycle racer. The build started with a 1975 Laverda SF2.